Dominion 2L Insecticide/Termiticide contains Imidacloprid and is used as a foliar or systemic treatment for termites, carpenter ants, and other wood-destroying insects. Dominion 2L can be trenched around homes for long lasting termite protection or as a surface spray for general insect control. Has a great residual and virtually no odor. Pests: Subterranean Termites and other pests. Read label for pest list. Not to be used against imported fire ants, pharaoh or harvester ants. 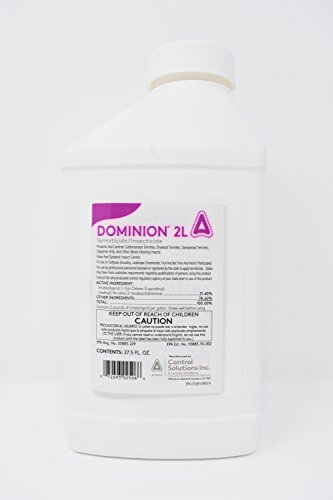 Dominion 2L is also a foliar and systemic insect control product. Outside only around homes or commercial buildings. Indoor spraying is limited to spot treatments for live termite infestations. The product cannot be used indoors for ant or pest control. Each 27.5 oz Bottle will make 50 gallons of finished solution which will treat 120 lineal feet. You should mix .6 fluid oz. per gallon of water, or 2.4 fl. oz. per 4 gallons of water per 10 feet. Non-Repellent termiticide. Also, this product is for use on turfgrass (including sod farms, landscape ornamentals, fruit and nut trees and interior plantscapes). If you have any questions about this product by Dominion 2L, contact us by completing and submitting the form below. If you are looking for a specif part number, please include it with your message.